Georgetown Will Offer An Edge In Admissions To Descendants Of Slaves : The Two-Way In 1838, 272 enslaved people were sold to fund the university. The school, grappling with that history, will give descendants of those slaves the same consideration as legacy students in admission. 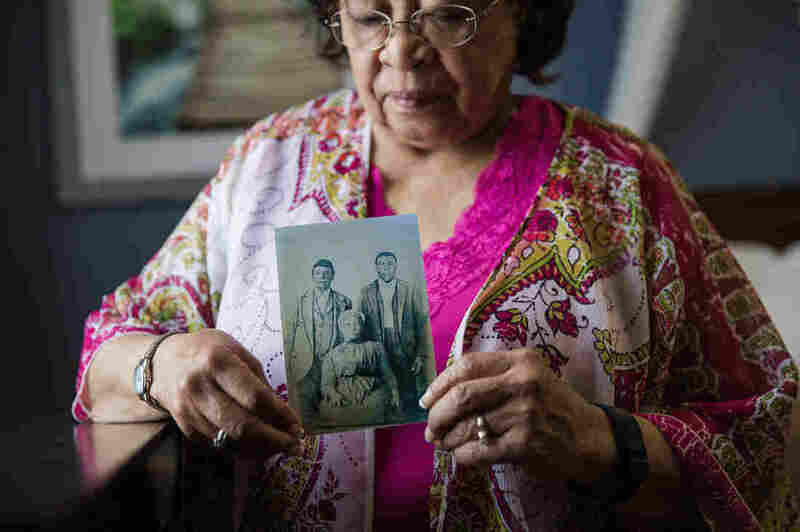 Patricia Bayonne-Johnson holds a photo of her great-grandparents and their son. The retired science teacher discovered that some of her ancestors were sold by the Jesuits of the Maryland Province in 1838, to pay off Georgetown University's massive debt. Georgetown University will be offering an admissions edge to descendants of enslaved people sold to fund the school, officials announced on Thursday. Jesuit priests connected to the private Catholic university sold 272 enslaved people in 1838, to pay off the university's massive debts. The men, women and children were sold to plantations in Louisiana; the university received the equivalent of $3.3 million, securing its survival. A working group, created last year to explore Georgetown's historical ties to slavery, says even more slaves might have been sold in the 1830s to keep the school afloat. And the school's connection to slavery is both broader and deeper than the one well-documented sale. Georgetown was supported by the plantations of Jesuit priests in Maryland; hundreds of people were enslaved by those Jesuits. An "unknown number" of other enslaved people worked in or for the school, the working group says. In their report, made public Thursday, the working group says much more research is needed to fill in gaps in the historical record. They also call for a formal apology from the university for the school's "historical relationship with slavery." And, the report suggests, the school should give descendants of people owned by the Maryland Jesuits "an advantage in the admissions process." On Thursday, the university announced it would be doing just that — specifically, by treating the descendants of those enslaved people the same way it treats legacy students, applicants whose family members attended Georgetown. The working group had also recommended that Georgetown explore the feasibility of offering financial assistance for those students as well. The university did not mention scholarships or financial aid for descendants of the enslaved. Additionally, the school will be renaming two buildings — formerly named after the two university presidents who made the arrangements to sell slaves to fund the school. The buildings had been temporarily renamed to Freedom Hall and Memorial Hall while waiting for their final names. One will become Isaac Hall, after one of the enslaved men who was sold in 1838, and another Anne Marie Becraft Hall, after a black educator and nun. "We hope that the two buildings will stand as a reminder of how our University community disregarded the high values of human dignity and education when it came to the plight of enslaved and free African Americans in the eighteenth and nineteenth centuries," the working group wrote in its report. Georgetown will also establish a memorial to the people whose enslavement funded and built the school, offer a mass of reconciliation and work to promote scholarship in the field of racial justice, it says. Universities across the country have recently been grappling with their historical ties to slavery and slaveowners — along with the contemporary problems of racism and racial inequity, frequently the subject of campus protests. But Georgetown's step, to consider the enslavement of ancestors as part of the admissions process, may be unprecedented, The New York Times reports. The Times — which published a lengthy report on Georgetown's legacy of slavery this spring — spoke to a historian named Craig Steven Wilder who said he knew of no other school that had offered that kind of preferential admission status. Wilder also cautioned, the Times reports, "that the significance of such a gesture would rest heavily on the degree to which Georgetown invested in outreach to descendants, including identifying them, making sure they are aware of the benefit's existence and actively recruiting them to the university." Georgetown says that it will "deepen archival resources to support genealogical work" and establish a new institute to research slavery and engage with descendants. The Georgetown Memory Project, an independent group, is currently working to identify descendants of those sold in 1838 to fund Georgetown. Richard Cellini, the founder of that project, told the student newspaper at Georgetown, that statistical models suggest up to 12,000 to 15,000 descendants may be living. If you count other people enslaved by Georgetown's Jesuits — including some who were never sold, but lived on campus — there may be more than 20,000 descendants, the student newspaper reports. You can read the full report from the working group below, and the statement from the university here. You can also explore the history of slavery at Georgetown at the Georgetown Slavery Archive, an online repository of primary source documents. The university's president, John DeGioia, is expected to speak at Georgetown at 4 p.m. ET on Thursday; the event will be streamed on Georgetown's website.